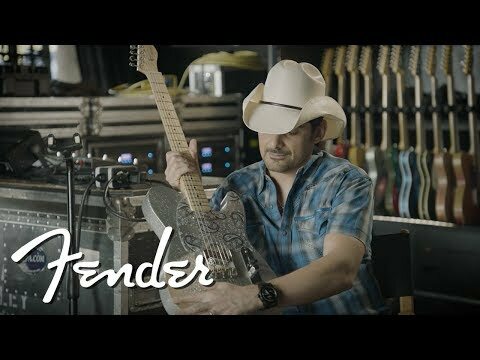 The Fender Brad Paisley Road Worn Telecaster MN Guitar in Silver Sparkle is the award-winning modern country music star's limited-edition signature model. Built to his exacting specs, this superb Tele' offers the same voice and sublime playability that Paisley enjoys on his very own gigging guitar. Now you can have your very own model to hit the stage with. Brad Paisley has a finely-honed playing style that incorporates percussive hybrid picking alongside expressive open chords, and is one of the most exciting guitarists in modern country. To give his dynamic playing style the tonal foundation he deserves, his signature Tele's body is crafted with a paulownia core with spruce top and bottom. The result is a lightweight yet highly resonant body that sings beautifully, responding to plucky guitar playing with a crisp attack. The rich acoustic-like response is perfect for everything from fast- to slow-playing styles. Fitted to the body is a solid and reliable neck, which is shaped to the "enhanced V" profile to accommodate lightning fast movement along the neck. The hand sits comfortably at the neck for an anchored feel, whilst the neck flattens out towards the body for lightning fast soloing. Paired with the neck is a sumptuous fingerboard, which is shaped to a 9.5-inch radius with medium-jumbo frets that are a dream for executing seamless bends on. The Brad Paisley signature Telecaster is equipped with a pair of pickups that have been given the nod by the man himself. In the neck position, you'll find a Fender Custom Shop Twisted Tele' single-coil, which delivers a hot response for a brighter output that allows midrange frequencies to sparkle. The bridge position is home to a Custom Brad Paisley Spec Vintage-Style Telecaster pickup, which delivers a smooth warmth that delivers just the right amount of twang. The Fender Brad Paisley Road Worn Telecaster MN Guitar in Silver Sparkle wouldn't be a the same without those all-important signatures touches. The body is home to a custom clear pickguard with black and silver paisleys. The road-worn silver sparkle finish matches that of Paisley's own tour-tested Tele'. The headstock is home to a cool cowboy hat insignia. This signature model is a must for Telecaster aficionados, country players, and anyone who wants an exceptional guitar that plays like a dream. Each model is supplied with a deluxe gig bah, so you can take your new playing partner anywhere the music takes you!